Maeve and team clean up! We had a strong turnout for the 31st annual Coastal Cleanup Day. Our 20 keen volunteers, just about the right number for this smallish site, were part of the biggest litter cleanup event in the whole world: 65,000 strong last year in California alone. Park rangers Kevin, Sara, and Justin greeted us warmly and helped us out by providing plenty of buckets and litter pickers. Volunteer Nancy had arrived early and got a head start, covering a large area and pointing out spots that needed more help. Girl Scout Haley arrived sporting a festive birthday hat and Mardi Gras-style necklace; what a lovely way to celebrate her special day. She was soon joined by the rest of her troop, along with some Brownies, and they efficiently organized themselves into teams. Two Dominican U students, who are studying how trash travels down waterways, arrived in flip-flops for a morning of beach-combing and community service. One Girl Scout mom, who has taken part in cleanups at McNear’s for years, reported far fewer discarded plastic bags than she ever used to, surely proof that the various bans and actions by the County, business, and advocacy groups such as Green Sangha are having a significant effect. Later, reviewing our data cards, I noticed far fewer polystyrene bits recorded than in years past. Could this especially problematic form of plastic also be slowly on its way out? The California Coastal Commission encourages volunteers to bring their own cleanup supplies and reusable drinking-water bottles. Those of our volunteers who hadn’t brought their own were provided with bags and gloves saved from past years, so not one new plastic bag or glove was used. 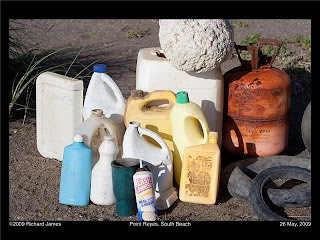 Between us we relieved the beach and picnic area of 12.5 pounds of trash – most individual items being plastic, no surprise there – and 9 pounds of recyclables, 21 pounds in all. That figure will be added to the California Coastal Commission’s database and analyzed, helping inform future educational and policy efforts. McNear’s beach is pretty well cared for by the rangers, but it’s an ongoing job to keep on top of the litter and they report that “there’s always more,” whether blown in by wind, dropped by picnickers, or washed ashore by tidal currents. So they were grateful for the extra help today. One item they’d love to see far less of is those plastic drinking-straw wrappers that come with juice cartons. Hmm . . . an item for future ban efforts? I spotted quite a few of our volunteers at the post-cleanup barbecue generously provided by the Lion’s Club for all Marin CCDay volunteers at CCDay headquarters at the Bay Model, Sausalito. The Ben and Jerry’s non-dairy ice cream was delicious – and by choosing a cone instead of a paper cup and plastic spoon, my treat produced no additional waste. As I licked my cone and enjoyed the harbor view, I reflected on how satisfying it felt to be part of a positive community effort to deal with our trash and help beautify our world. 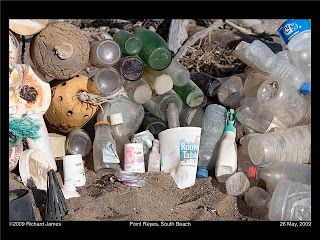 This entry was posted in Rethinking Plastics News and tagged Coastal Cleanup Day, Litter on September 22, 2016 by Stuart Moody. California Coastal Cleanup Day may be the largest marine-related volunteer event in the world. Last year’s slogan was “Help make trash extinct”! You can help reach this goal and contribute to citizen science while enjoying a day of fresh air and heart-filled service to the environment . . . and who doesn’t love beach-combing? 1. Marin County. McNear’s Beach, 201 Cantera Way, San Rafael, a lovely bayside park overlooking the northern bay. 2. East Bay. Next to the Emeryville Fire Station at 2333 Powell St., across from the Watergate Market. When: Sat, Sep 20, 9am – noon. Cleanup starts with a brief orientation and safety talk. Come early even if you can’t stay the whole three hours. McNear’s Beach includes about one mile of shoreline, and is a relatively well-cared-for beach, but in 2012 we still managed to collect 91 pounds of trash and 6 pounds of recyclables! More about McNear’s Beach here. Emeryville coordinator Marcy Greenhut promises free refreshments, raffle prizes, and chair massage, provided by local businesses! More about Emeryville cleanup here. Also bring your own reusable supplies if possible, to help cut down on waste and save funds. This could mean a bucket, trash bags, and gloves if you have. Directions to McNear’s: Drive out Point San Pedro Road from central San Rafael; signs will show you the park entrance. Tell the ranger you’re volunteering with the beach cleanup, then park at the far (northerly) end of the lot. We’ll be at the picnic tables by the snack bar. Beach captain: Maeve Murphy (455-9577). Click here for a map. Please consider biking, public transport, or carpooling to the site with your friends. Volunteers who drive to the cleanup can park for free (the normal weekend fee is $10 per car); just tell the rangers at the entrance that you’re a CCC Day volunteer. You are invited to the Bay Model in Sausalito for an after-cleanup barbecue. To prevent waste, please BYO plate, cup, and eating utensils as only throw-aways are provided. There are scores of locations around the Bay Area. More information and additional sites listed by the California Coastal Commission here: California Coastal Cleanup Day. 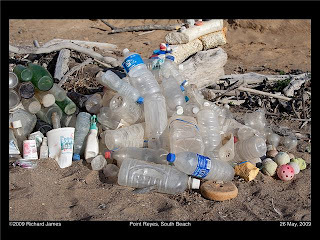 This entry was posted in Rethinking Plastics News and tagged Coastal Cleanup Day, Litter on August 28, 2014 by Stuart Moody. California Coastal Cleanup Day may be the largest marine-related volunteer event in the world. This year’s slogan is “Help make trash extinct”! You can help reach this goal and contribute to citizen science while enjoying a day of fresh air and heart-filled service to the environment . . . and who doesn’t love beach-combing? 1. McNear’s Beach, 201 Cantera Way, San Rafael (among scores of locations around the Bay Area), a lovely bayside park overlooking the northern bay. 2. Damon Marsh, MLK Jr. Regional Shoreline, a 741-acre park protecting the remainder of a once-extensive marshland at San Leandro Bay. The park includes the Martin Luther King Jr. Memorial Grove, completed with community support and dedicated in 1993. The 50-acre Arrowhead Marsh is a stop-over on the Pacific Flyway and is part of the Western Hemisphere Shorebird Reserve Network. When: Sat, Sep 21, 9am – noon. Cleanup starts with a brief orientation and safety talk. Come early even if you can’t stay the whole three hours. McNear’s Beach includes about one mile of shoreline, and is a relatively well-cared-for beach, but in 2012 we still managed to collect 91 pounds of trash and 6 pounds of recyclables! More about McNear’s Beach here. · If you’re driving on 880 take the 66th Ave/Zhone Way exit and turn toward the airport (west). · Drive to Oakport St and turn R (there will be a sign at the intersection). · Proceed ¼ miles and on the L side you will see a yellow gate and signs. · Go through the yellow gate and follow the signs down the entrance road to the parking area. · Sign-in area is by Damon Marsh Trail. More information and additional sites listed by the California Coastal Commission here: California Coastal Cleanup Day. 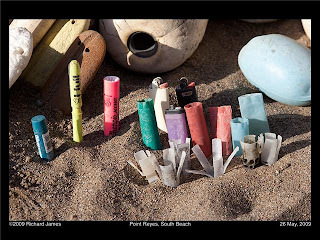 This entry was posted in Rethinking Plastics News and tagged Coastal Cleanup, Litter on September 4, 2013 by Stuart Moody. Leila Monroe, staff attorney at NRDC, just sent us a 2012 paper by the Convention on Biological Diversity. The Center reports that 663 marine species have been harmed by marine litter through entanglement and ingestion—a two-thirds increase in species from a similar study in 1998. You can see the report here: Impacts of Marine Debris on Biodiversity. West Coast Communities’ Cost of Managing Marine Debris. We don’t have to keep living this way. On Thursday, March 7, and Saturday, March 16, join fellow citizens and decision makers to listen, learn, and converse on ways to end the plague of plastic pollution. Chris Pincetich, PhD, will be one of the local leaders at both events, giving us insight into the problem, and discussing solutions that are already at hand. Come to Berkeley on Thursday, March 7, for an evening of Films and Conversation. Then, come to Lafayette on Saturday, March 16, for a day-long exploration of issues and possibilities for action, from home to office to government, with Chris, Dr. Marion Guyer, author Beth Terry, and other luminaries. Register here. 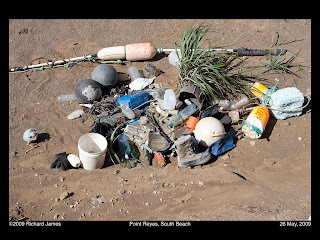 This entry was posted in Rethinking Plastics News, Uncategorized and tagged Litter, Plastics 360, Wildlife on February 22, 2013 by Stuart Moody. At McNear’s Beach in San Rafael we had a great turnout for the largest volunteer event in California: 80 volunteers, breaking last year’s record of 55 by a wide margin! Participants included Cub Scout pack 53, the Tam 4-H Club, whole families, and lots of other local folks who care about their beaches and Bay and the wildlife they are home to. McNear’s is a popular and pretty well-cared-for beach and picnic area, but our dogged volunteers still managed to find 41 pounds of trash (about four large trash bags’ worth) and 6 pounds of recyclables. When Ranger Jim showed up in his motorized cart with a 50-pound piece of dumped cyclone gate, the grand total came to 91 pounds! Whew! And let’s not forget the six pounds of recyclables we recovered, which will not end up in landfill. It was striking how much less Styrofoam (a subset of plastic) was found compared to last year (580 pieces). Could the increasing number of businesses switching to non-polystyrene food takeout containers be making a very real difference? Thanks to Rangers Dan and Jim and their colleagues for helpfully supplying buckets and litter pickers, and the other ways they supported our efforts. And a big thanks to all the volunteers who showed up with buckets, gloves, and their enthusiasm: you helped beautify McNear’s and make it safer for wildlife, while contributing to citizen science. We salute you! This entry was posted in Rethinking Plastics News and tagged Coastal Cleanup, Litter, McNear's Beach on September 15, 2012 by Stuart Moody. Mark you calendar for the nation’s most popular volunteer environmental event of the year! Coastal Cleanup Day, Saturday, Sep 15, 9 am to noon. Join Green Sangha members at one of two sites: 1) Damon Slough at the Oakland Coliseum, 2) McNear’s Beach in San Rafael (our 9th year!). You may also go to any of scores of spots in the Bay Area (check the Coastal Commission’s web page here, and click on their link for “local coordinator” to find a site near you). Wear sturdy, close-toed shoes, layers for changeable weather, a hat and other sun protection as needed. Bring also a water bottle (reusable, of course), gloves, and a bucket if you have one. The Coastal Commission is making a big push for zero waste at the clean-up, in response to many participants’ comments about throw-away plastic bags (replete with corporate sponsors’ names) being used in the past. We topped our ’08 & ’10 highs of 52 volunteers, with a total of 55 individuals participating. Volunteers collected more fishing line than ever before: 183 Pieces. Ugh! Biggest number: Volunteers picked up 937 individual pieces of plastic (not counting whole items such as bottles or pipes). Double ugh! The top item, though, was Styrofoam (a subset of plastic pieces): 580 bits. If you have ever tried recovering littered foam, you know how easily these pieces break apart. In 3 short hours, 55 volunteers recovered a total of 2511 pieces, ranging in size from large (a car tire, fishing nets, crates) to miniscule (Styrofoam bits, cigarette butts). There’s no way to know for sure the long-term impact of each piece of litter. Some types (fishing nets, for example) appear far more hazardous to wildlife and boats than others. But we might estimate an average cost of one animal’s life per piece of litter. If so, we saved 2511 animals’ lives on that sunny morning. Here’s a special shout-out to Bernard, Maeve, and Sita, who combed the shore for those hundreds of plastic pieces; to Ishon and friends, who retrieved a long fishing net (and a balloon from a tree); to the Girl Scouts, 4-H Club, and everyone else who brought their gloves, buckets, and smiles. 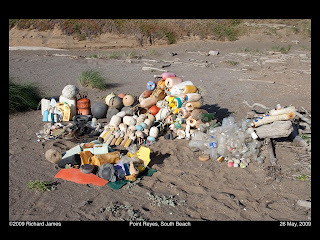 This entry was posted in Rethinking Plastics News and tagged Cleanup, Coastal Cleanup Day, Litter, Volunteer on August 27, 2012 by Stuart Moody. Litter has been with us since the dawn of time. But with the dawning of the age of non-biodegradable synthetics, and the profusion of these materials in single-use, disposable products, litter has taken on enormous proportions. We’re just beginning to consider the consequences. On Tuesday, May 26, Green Sangha co-sponsored a presentation by Algalita Marine Researchers Anna Cummins and Marcus Eriksen, to help us visualize those consequences. The speakers described the voyage of the “Junk,” a plastic-bottle boat that sailed from Long Beach to Hawaii in the summer of 2008. They showed us pictures and videos, displayed items found on their ocean travels, and told the story of their journeys into the North Pacific Gyre, where plastics that outweigh zooplankton are entering the food chain and disrupting life’s essential processes. Whether we see the debris littering our shore, or peer at jars full of plastic confetti recovered in ocean trawls, the invasion of plastics into our ecosystem is inescapable. While we are all struck by Algalita’s initial 1999 finding of a 6:1 ratio of plastics to zooplankton in the North Pacific Gyre (cited even as recently as Moore’s 2008 paper in Environmental Research), Anna & Marcus pointed out that zooplankton concentrations vary widely by season and time of day. A more reliable benchmark, they said, is the concentration of plastic particles per unit of surface area. In 1999, they found .002 gm/m2. In 2008, the concentration had doubled to .004 gm. They reported on their visit to Kamilo Beach in Hawaii, where the plastic trash can go up to your knees. And this was three months after the beach had been cleaned of all litter. Scooping into the beach at the high tide line, they found more plastic particles than sand. They spoke also of Midway Island, about the size of a college campus. They found hundreds of Laysan albatross carcasses with plastic pouring out of their abdomens. They cited the finding of Laist (1997) that 44% of the world’s seabirds species are susceptible to plastic ingestion or entanglement. In addition, 22 kinds of cetaceans, all marine turtles, and a growing list of fish are so affected. They reminded us that 80% of ocean litter comes from the land. Even riding their bicycles through Oregon, considered one of the cleanest states, they could not travel more than 20 seconds before they saw another piece of roadside litter. (In the San Francisco Bay Area, the Regional Water Quality Control Board reports an average of 3 pieces of litter along every stream that feeds the Bay.) Whether we see the debris littering our shore, or peer at jars full of plastic confetti recovered in ocean trawls, the invasion of plastics into our ecosystem is inescapable. Amphipods, barnacles, benthic worms, jellyfish, salps, lugworms, and plankton have all been documented to ingest plastics in their surrounds. 2. Markets for recycled plastic are limited. 3. Plastics are easily contaminated by foodstuffs and other materials; types of resins are also easily confused in the high-speed sorting of materials at recycling centers. 4. Low melting points of plastics means that they must be washed instead of burned clean. 5. Down-cycling is the best that we can get out of plastics recovery. 2) Require EPR for all durable goods. 3) Create an economic incentive for retrieval of all plastics loose in the environment, perhaps 25 cents per pound. We might add to this list: 4) Institute the Precautionary Principle as a screen for all new chemical and manufacturing products and processes. Include a retroactive recovery and replacement program for all synthetics already on the market with proven endocrine-disrupting effect. This program would be paid for by fines on companies that produced these synthetics. Many of us have already begun the process of change, diminishing our purchase of items made of, or wrapped in, plastic. We have spoken to friends and family, even encouraged and instituted zero-waste practices at office parties and school events. Others have hosted presentations on Rethinking Plastics. Others are tabling at Marin Farmers’ Markets to inform fellow customers about healthy alternatives to plastic. Some of us have written letters to legislators and spoken at public hearings. * Come to a screening of Addicted to Plastic, an entertaining and informative film, on Thursday, Sept 10, at the Rheem Theatre in Moraga. The event opens at 6 pm with wine and cheese tasting; the film starts at 7 pm. * Join Cathy Rosekrans’ team of volunteers at the Civic Center Farmers’ Market the third Sunday of every month, where we educate customers on healthy alternatives to plastic; or come to the Oakland and Hayward markets on Saturdays. Contact Cathy at katerine2@earthlink.net. * Think of one business that is selling unnecessary plastic (e.g., plastic water bottles) and talk with us about how to inspire them to change. * Contact us for names of businesses that we’ve already identified as good candidates to hear this message. * Write letters to legislators on bills pending in Sacramento this year: EPR (Extended Producer Responsibility), plastic bag fees, and a styrofoam ban. These have all been moved to the “two-year calendar,” meaning that they have been postponed for consideration till Jan 2010. It’s not too early to start reminding our legislators that we need this action. * Speak to your city council about banning styrofoam and all throw-away petro-plastics such as straws, cups, and lids. Green Sangha will be sending updates on opportunities periodically, but please let us know if you have ideas of your own or need support for follow-through. We will be offering the Rethinking Plastics training in September and October in Berkeley, preparing volunteers for speaking, for tabling at markets and other venues, for outreach to businesses, and for civic advocacy. We start Thursday, Sept 24. Each class goes from 7 to 9 pm. RSVP if you would like to participate! In the meanwhile, know that many inspired activists are taking on the Herculean task of re-imagining our world, from one dominated by empire to one constructed of community. Join us as we build that community through meditation, education and support, and awakened action. All Pt. Reyes beach litter photos on this post (first picture, and all below): Copyright Richard James, May 2009. 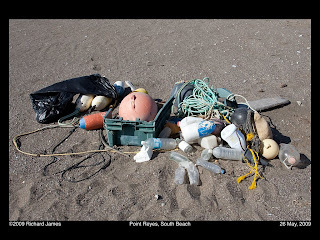 This entry was posted in Rethinking Plastics News and tagged Algalita, Junk, Litter on June 2, 2009 by Stuart Moody.